Electrical conduit market, over the past few years, has garnered phenomenal traction primarily on account of the crucial need for safe and secure wiring frameworks across the globe. Given the fundamental protection and routing these tubes provide to electrical wiring in building and other structures, it comes as no surprise that the demand for various types of electrical conduits has been growing exponentially. Furthermore, the increasing electrical retrofitting activities and smart grid deployments across several developing economies have been creating a favorable commercialization scenario for the global electrical conduit market. In fact, in the year 2017, the overall remuneration portfolio of the electrical conduit industry was projected to be over USD 5 billion. The vast revenue potential significantly highlights that the demand for electricity has risen several notches up in the recent years and the electrical conduit market is benefiting extensively from the same. The penetration of distribution and smart grid networks across the industrial, commercial, and residential peripherals has generated greater demand for low & high voltage lines. Reports reveal that 1 ¼ to 3 trade size electrical conduits, in this regard are gaining huge demand on account of the growing large-scale commercial establishments and revamping actives in small-scale platforms. The ½ to 1 trade size conduit, moreover, is expected to garner huge profits because of the flexible product configuration and the rapid expansion of the low-voltage distribution networks across the residential areas. Estimates claim that the ½ to 1 trade size electrical conduit market is likely to record a CAGR of 8% over 2018-2024. Furthermore, it is noteworthy to mention that the commercial and residential applications cumulatively accounted for more than 50% of the global electrical conduit industry share in 2017. Rising awareness levels and mandatory government standards required to prevent fire, operational hazards, electrical supply faults, and health have further necessitated the demand for installing electrical conduits in the residential and commercial sectors. Rapid economic escalation across developing countries giving rising to robust electrical refurbishment activities and smart grid transformers installation activities are majorly driving the regional electrical conduit market share. The on-going regulatory re-structuring work along with rising energy consumption across the emerging industrial and private sectors cross India, China, and other developing nations are all poised to favor the product demand in the coming years. The Government of India’s program of “One Nation One Grid” to link all the states with national grids and achieve a single tariff structure has been an apt instance bearing testimony to the aforementioned. In line with this, the expansion of the railway infrastructure, requiring electric network retrofitting on large-scale, has also been significantly driving the regional growth. Given the requirement of extensive power distribution networks across the railway and mining industries, the metal & underground electrical conduit market has been witnessing exceptional traction. As these trends are especially prominent across the developing economies of Asia Pacific, industry analysts predict this region to be a lucrative investment hub for potential stakeholders. Recently for instance, Best Steel Logistics, a renowned company operating in the Indian electrical conduit market, has developed electrical conduit pipe which can be used in place of its PVC counterparts. According to reports, the company has put its Bangalore-based plants at work for manufacturing TriCoat Tubes in three variants including DuraCoat, SureCoat, and SuperCoat designed with next-gen galvant technology obtained from the United States. The new product, will have a triple-layer of protective coating of paint, Zinc, and UV organic coating and will be used worldwide as a substitute for PVC electrical conduit. The instance stands as a significant substantiation to fact that the regional players are increasingly making efforts in investing in R&D and product innovation projects to source lucrative growth avenues and cater to the high regional demand. Besides APAC, the Middle east and Africa electrical conduit industry is also expected to witness lucrative investment trends. Growing demand for an effective electric infrastructure coupled with rising governmental and private funding from institutes such as the World Bank, African Development Bank, and IFC for electrification will significantly led to positive product demand from the region. It has been reported that the MEA electrical conduit market will exceed remuneration of USD 1 billion over the coming six years. All in all, encompassed with a strong application landscape, the electrical conduit has become an essential vertical pursuing the electrification trend and economic growth, in turn swaying the commercialization of these products. 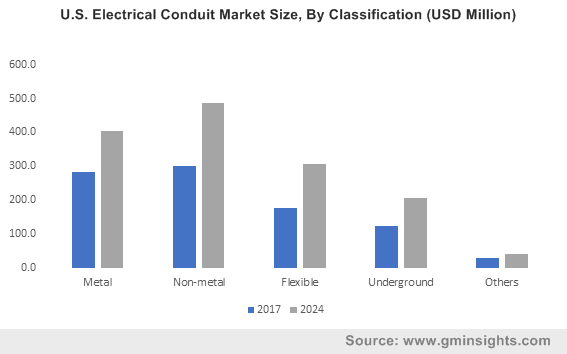 A recently complied report by Global Market Insights, Inc., further sheds light on the growth prospects of this business sphere and claims the global electrical conduit market to outpace USD 9 billion by 2024.